PHILADELPHIA – In just three remarkable years, Don Maloney transformed the Phoenix Coyotes from League doormats to division title and Stanley Cup contenders. In a similarly brief but emotional ceremony that opened Wednesday morning's annual June meeting of the League's general managers, Maloney was honored for that rebuilding job -- in particular, the topping-off work he did over the last 12 months. With his 29 peers seated around a ballroom at the Ritz-Carlton Hotel in shadow of Philadelphia's iconic City Hall, Maloney was presented with the inaugural National Hockey League General Manager of the Year Award by NHL Commissioner Gary Bettman. The award was voted on by a 40-member panel that included all 30 general managers, five NHL executives and five media members. Maloney, George McPhee of the Washington Capitals and David Poile of the Nashville Predators received the most votes and were designated finalists. "I'm truly honored and humbled by this award," a visibly touched Maloney told the group. "When I placed my vote, my first vote went to George in Washington. I thought: The object is to win and the Caps had the best record (in the NHL). Not only that, their minor league team is playing for championship. That, to me, is worthy of an award. "My second choice was David Poile, he always does the most with the least. We all know how dangerous that team always is. " The panel, however, gave the nod to the GM who presided over the most stunning one-year metamorphosis. All under the most arduous of circumstances -- while the franchise was undergoing an ownership change amid uncertainty about where it might play its home games. "I think it is particularly fitting that this year's recipient excelled in both categories -- on and off the ice," Bettman said. "He took a team that hadn't made the playoffs for a number of years and he restored their credibility on the ice. And he probably operated under the most difficult of circumstances that any general manager can operate under – because, in addition to having to report to Bill Daly and me, he had to operate a team that, in effect, didn't have an owner. "He held it all together. He enabled this team to not only survive but to thrive. And it is in recognition of an outstanding season that Don Maloney is the inaugural General Manager of the Year." Coming off a 2007-08 season in which a Coyotes' roster dominated by young players faded under the pressure of the stretch run, Maloney determined that it was time to supplement his patient organizational building philosophy with a dose of veteran-provided urgency. "Honestly, I felt it was the right way to go and the only way to go to survive in Phoenix," Maloney said. "Not only that, but to have success long-term – the kind the Devils have had – we had to put our young players in positions to improve. And I think by doing that, by putting them where they should be and by filling in with some free agents we could afford, it sort of set the tone for our franchise. 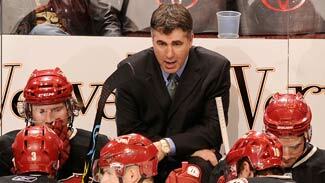 And certainly our coach, Dave Tippett, did a remarkable job. "But to me now, I feel much clearer about where we have to take this team than ever. When you put young players in the lineup, it's a lot of hope and a prayer that you can be successful. Very few teams can win in this league with so many young players. So all in all, I felt it was the only way we could go to survive and stay in a place we all love and where we all want to stay." But putting that plan into practice was complicated when Coyotes ownership unnecessarily placed the club into bankruptcy, forcing the League to go into court throughout last summer to defend the ability to enforce its franchise rules and prevent the relocation of the Coyotes from Glendale, Arizona. Still, Maloney managed to recruit and sign unrestricted free agents Adrian Aucoin, Jason LaBarbera, Taylor Pyatt and Vernon Fiddler. He also re-signed forwards Scottie Upshall and Daniel Winnik and defenseman Keith Yandle. Maloney also worked the trade market to acquire former Coyote Radim Vrbata from the Tampa Bay Lightning, defenseman Jim Vandermeer from the Calgary Flames and forward Lauri Korpikoski from the New York Rangers. The roster taking shape, the Coyotes' bench was in upheaval on the eve of the season when Wayne Gretzky, caught in the middle of the protracted legal battles, decided it was best for all concerned if he stepped aside. Maloney moved swiftly to hire Tippett -- matching the perfect high-structure head coach to a roster that needed to gel. The results were instantaneous and spectacular. The Coyotes won nine of their 13 October games, establishing themselves as one of the League's best defensive teams in front of goaltender Ilya Bryzgalov, whom Maloney had claimed on waivers on Nov. 17, 2007 -- just a few months into his tenure as Phoenix GM. While skeptics kept waiting for them to fall off, the Coyotes banded together and kept climbing. Despite residing in the relentlessly competitive Western Conference and in the same Pacific Division as perennial power San Jose, Phoenix remained in the division and conference title hunts until the final week of the season. Undoubtedly, Maloney's deft work at the trade deadline in March helped make that possible. His acquisitions of RW Lee Stempniak, LW Wojtek Wolski and C Petteri Nokelainen, plus defensemen Derek Morris and Mathieu Schneider at the deadline propelled the club to even greater heights as Phoenix won nine consecutive games immediately following the deadline to tie a club record. By season's end, the Coyotes had set franchise records for victories and points in a season, going 50-27-5 to make the playoffs for the first time since 2002. That represented a whopping 28-point improvement over 2007-08. What's more, building excitement in the community, the Coyotes sold out their last four home games at Jobing.com Arena. They then sold out four more in the playoffs, while extending the two-time defending Western Conference champion Detroit Red Wings to a deciding seventh game in the conference quarterfinals. For all that, Maloney was selected the first recipient of an award that was first envisioned by Toronto GM Brian Burke in 1993 when he was Senior Vice President and Director of Hockey Operations for the NHL. "We had a good year and this is the culmination of a lot of hard work by a lot of people in our organization, really," Maloney said. "It's not me."